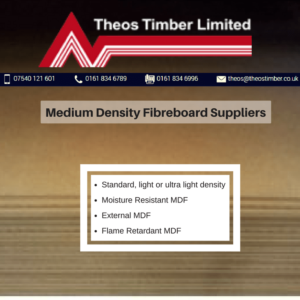 Look no further for MDF suppliers than here at Theo’s Timber. We are a family owned business, based in Manchester and are experienced timber merchants and wholesalers, with clients throughout the North West. We stock all types of timber, including a wide and varied stock of MDF. As such, we are one of the region’s leading MDF suppliers. What types of MDF do we supply? Low-grade MDF is prone to swelling and breaking when wet. Our moisture resistant MDF can be used for kitchens, bathrooms and even wet rooms. MDF is commonly used for indoor building projects. Our external MDF however, is ideal for outdoor use. For example, fencing, gates and summer houses. This is used where there is a higher than normal risk of fire, in schools, hospitals or hotels, for instance. There are two classes of flame retardant MDF, B and C, class B has been tested and approved to be fire resistant for 60 minutes, using the same tests class C is fire resistant for 30 minutes. We deliver to towns and cities throughout the North West. Unlike many other MDF suppliers, we run our own fleet of vehicles and do not outsource our delivery service. We believe that this provides a better customer experience, by allowing us to keep our prices down. In addition, we can guarantee to deliver on your requested date. For the convenience of our customers, we offer a click and collect service. Just call us to check if a product is in stock, click and pay for your purchase online, then collect it from us.